If your monkey is raised with dogs and plays with them, then chances are if they get out, they will not have a fear of dogs. However, other people’s dogs do not understand monkeys. This issue with dogs takes many monkeys lives away early when they get away from their home. If your monkey is kept inside, then chances are they will not go up into the trees to be safe if they leave your home. They will travel and stay on the ground to obtain a feeling of safety. Monkey have many gifts of survival that will kick into play when they get away from your home. Monkeys live in the now moments. They will be trying to survive what has happened to them. They will look for a supply of water and food. If by chance you keep your monkeys outside for many hours during a week they will become very curious, comfortable, aware of the outside sounds, and do very well at being outside if they were to get away from your home. Monkeys that are kept this way also might possibly choose to go up into the trees to travel. Because there are still some monkeys who are wild caught monkeys, it is very likely that they will choose to go up into the trees to travel. 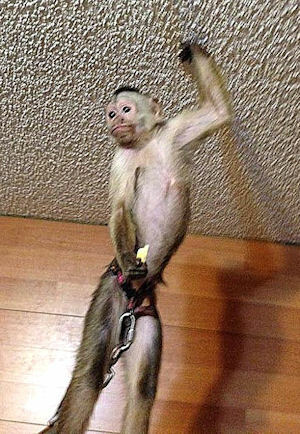 Some monkeys that are kept mostly outside wish to enjoy their freedom when they get a chance to escape their cages. These are the monkeys that may keep you looking and watching out for them for many days – weeks – or even months. Accidents happen so quickly with monkeys. Remember to follow good “Safety First” practices and follow them every time you open and close the cages or the doors into your home. Most monkey wish to be found and returned home often after they have spent a night or two away from their comfortable home life where they have soft blankets, good food and clean water. IF THIS TYPE OF THING HAPPENS TO YOU REMEMBER TO REMAIN POSITIVE ABOUT GETTING THEM HOME. I, of course, have had monkeys to escape their enclosures but I have always been successful in their quick and safe return. 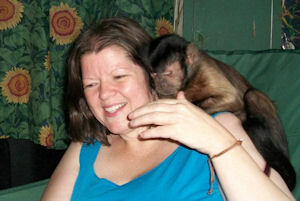 I wish I could say that all of the stories that I have heard from other monkey caregivers were always positive. 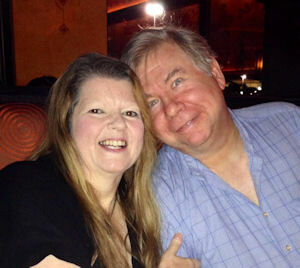 I feel though that if I am not going to be successful with getting them back home, I wish to know at least that I thought every positive thought about getting them back and tried everything possible to network by getting my area covered with contact information. Try to be constantly thinking and feeling that you are going to get your monkey back. I wish to be able to know without a doubt, that I did everything I could to get the monkey safely home. If you find yourself in a search such as we have been talking about, please remember to remain positive that you will get you monkey back home. One negative person can cause other people to join with their negative thinking that is being displayed. So, please stay on top of everyone’s attitude and belief about being successful. It could be the thing that turns everything around and you get your positive outcome and that is your monkey back safely in you r arms or home. 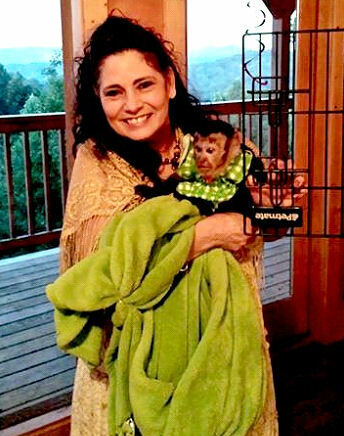 I don’t think I was even aware of how much I knew about getting a monkey back home until two years ago when I offered to help Danny and Lisa Covington get their Tiki back home. Through Facebook we had found out that our monkeys were half brothers. who were four days apart in age. 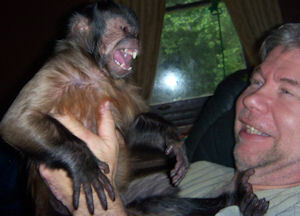 My Silly Willy and their Tiki were both five years old when Tiki made his great escape. We had been in communication with each other but had never been able to speak or meet each other when I read on Facebook that Tiki was missing in an area just 30 minutes away from me. I instantly messaged Lisa on Facebook. When I read the post, she told me what had happened in his escape. She, herself, was waiting for Danny to return home to get more information about his search. She ask me to call him on his cell phone, so I could get the up-dated information directly from him. I, of course, did this very quickly. It was very late, maybe 11:30 or mid-night, when he answered the phone. I instantly told him who I was, and then asked him to get me caught up on how his search was going. I could tell that he was tired, distraught, fearful, and was loosing hope, so I began to tell him these things that I have been sharing with you in these last two posting here on Primate Care. It just came rolling out of my mouth. At a later time Danny informed me that I had given him hope. He had reached his lowest point and felt that he would never get him back, when the phone rang and it was me on the other line. All of the things that I shared with you here were used to get Tikli back home safely. Danny had a plan to follow which gave him hope. He also was talking to someone that was positive and knew without a doubt that if it took days we would keep following him and get him back. This was just what he needed to kick himself into action. Danny told me that after we talked that he never again thought that he would not get Tiki back home safely. The postie attitude that I had transferred to him and his family had changed everything. They found out by posting the sightings of Tiki on the map that he was circling just as I had told him. Danny could see from looking at the map that he was trying to get back to where he had escaped. They’re notorious, Tiki had escaped while his monkey-sitter was outside with him in their yard. Tiki was not at home when he escaped. He is one of the smartest monks that I have been around and in this case his smartness was not so good. 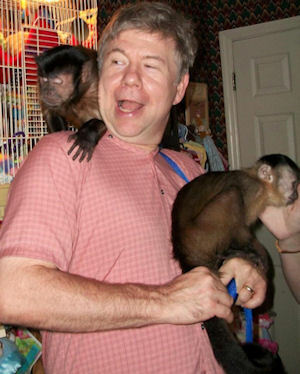 He saw that the monkey-sitter (for a moment) did not have a hold of the lead handle with her hand. The handle was dangling just on her wrist. In that moment, when he saw this, he used both hands to slip that lead handle off of her wrist and darted away. We are all so thankful that Tike got into the now moments and survived one night outside in a 30 acre field that a few houses backed up to. Tiki has recently gone through a difficult time in the change of adding a playmate for him. 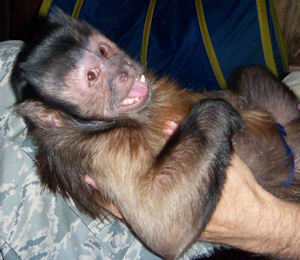 His playmate’s name is Caspar and he is a five year old Wedge-Cap Capuchin. When Tiki was found by a homeowner (who by the way would not take the reward money) he did not know which one of his parents to hug the most, Danny or Lisa. He was one happy monkey to have his family back. Don’t We All Love Happy Endings? Yes, Without A Doubt, We All Knew That We Had Experienced A Miracle That Day! Thank you for visiting us here at Primate Care. We are committed to bringing good information for you to think about and share with your family, friends, and other monkey caregivers. 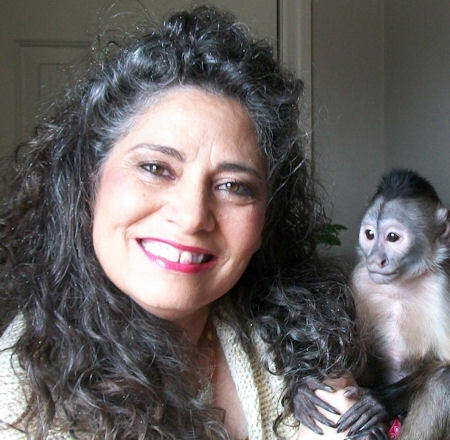 In the next posting on the Primate Care site I will be speaking about cage escapes out into you home while you are gone. 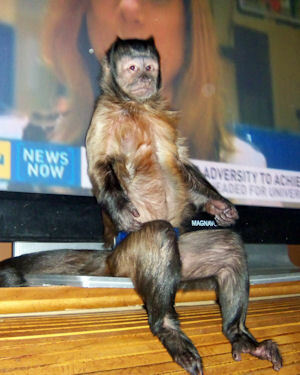 Oh, yes, the next topic of being a “Safety First” monkey caregiver is going to have some really good stories.